What is an Alaska Last Will and Testament? 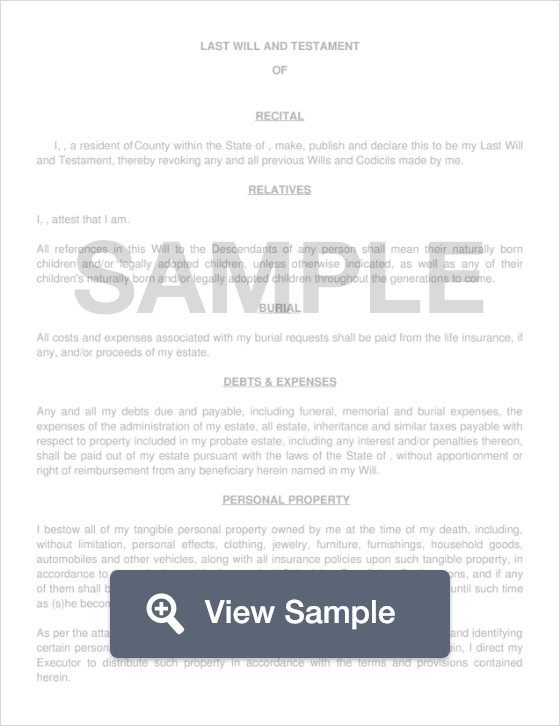 Alaska Last Will and Testament: What Is It? A Last Will and Testament, also referred to as a “Last Will”, or simply a “Will”, is a document that specifies how a person intends to distribute their property after their death. Though Wills are governed by the state government in which the fall under, they are legally enforceable so long as the proper laws and guidelines are followed. A thorough Will should clearly name beneficiaries, as well as what should be done with personal and real property to ensure that there are no miscommunications when the Grantor passes away. A Last Will and Testament is also known to as a “Last Will”, or simply a “Will”. Witnesses - According to AS 13.5.302, two (2) witnesses must sign the Will. Additionally, the state recommends that these two witnesses not be beneficiaries of the document. Step 1 - Using your FormSwift Template, provide your name and gender. Step 2 - Specify the city and county where you live. If you’re single, proceed to the next step. If you’re married, divorced, widowed, separated or engaged, enter the name of the person, and designate whether or not this person is to be named as a beneficiary. Step 4 - Specify if you have any children, along with pets, property, or life insurance. Step 5 - Provide the names of your children (if any), whether they are deceased or living, and whether or not they will be named as beneficiaries. In addition, provide the names of pets, and information about any life insurance. Step 6 - Specify what you would like to leave each child, as well as the percentage of property they will inherit. Step 7 - Indicate whether or not you’d like to set up a trust for someone who is disabled or mentally ill and requires special care. This can prevent any interference with their ability to receive Supplemental Security Income and Medicaid benefits. Step 8 - Specify the age that you’d like your children to be before they start receiving benefits from their trust, as well as the portion that will be received. If the benefits will expire, enter what age the beneficiary will be when the benefits end. Step 9 - Describe whether or not you wish for your body to be taken to a specific funeral home once you die. If so, provide the name and address of the funeral home. Step 10 - If you know where you would like the meal after the funeral service to be held, as well as any other burial arrangements, specify that information in this step. Step 11 - Naming an Executor - An Executor is a person charged with administering your estate once you pass away. This can be a beneficiary or someone else that you trust, such as an attorney or good friend. If an Executor is not named in a Will, the court will appoint one. If the Grantor has an appointed Executor, provide the following information. Additionally, state whether or not you would like to appoint an alternate Executor. If so, state his or her name and your relationship with them. Also, if there is someone you do not wish to act as Executor under any circumstances, state their name, and relationship with you. Step 12 - Appointing a Trustee - If your assets are already in a trust, you must appoint a Trustee who will be responsible for distributing the assets from the trust. Similar to excluding potential Executioners, if there is a person that you do not want to act as a Trustee under any circumstances, state the name and relationship this person has with you. Step 15 - Guardian for Minor Children - If you wish to appoint a guardian for your minor children, provide the following information of the appointed Guardian, followed by the name of any Conservator. In order for this document to be legal, it must be signed by you, plus two (2) witnesses. In addition, the document must be notarized by a notary public.